I posted a picture on Instagram earlier today of my latest DIY makeup storage solution, and it caused quite a flutter. I've had the Ikea Alex 9 Drawer Unit for almost two years now, and I was never really 100% happy with how most of my makeup was stored. 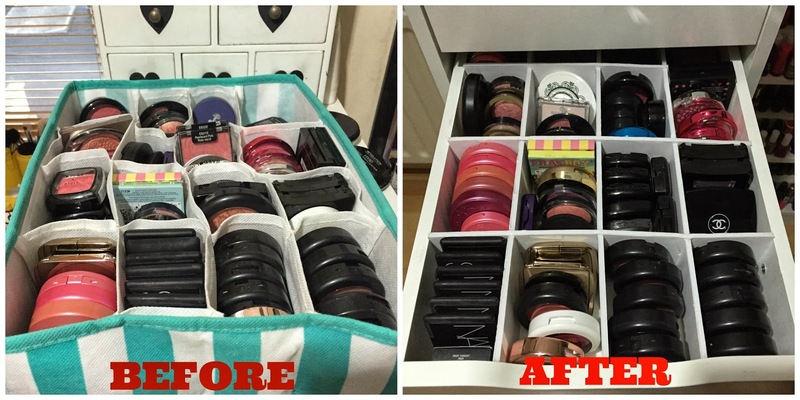 I used the Antonius inserts but I found that these were bulky and took up a lot of space without storing enough/ I also had some drawer organisers from Penneys/Primark but these were far too flimsy to store the volume of products that I wanted to keep in them. I blogged last year about my lipstick storage solution (click here if you would like to jog your memory) and my nail polish storage solution (read all about it by clicking here) and those DIY posts were quite well received, so I thought I would share my latest storage invention. I love DIY and art and I'm pretty creative, so I took myself off to Art & Hobby to look for supplies to build the perfect dividers. 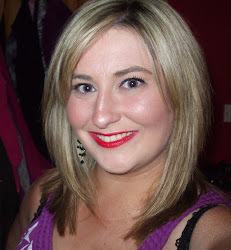 I'm absolutely chuffed with how these turned out so if you want to find out, keep reading! Foamboard- This is the key component of this storage solution. I picked up an A1 5mm size card which was big enough to create dividers for four different drawers. This cost €5.99 in my local Art & Hobby which was bargainous. Even though there was only one depth available in the store I went to, there were lots of different sizes- A1, A2, A3, A4 etc. Try to get the 5mm depth if you can because this will reinforce the structure of the foamboard when you chop them down into dividers. Stanley Knife/Blade- I love me an auld Stanley knife and this works perfectly at cutting through the foamboard neatly. Neat is absolutely key in creating these dividers so make sure you have a good sharp blade and something to protect your work surface. Measuring tape- You will need to know the exact measurements of your drawer. Pen and ruler- for marking the foamboard out and getting the right measurements. Detailed plan of desired end result- this is mucho importante and the success or otherwise of your drawer divider mission will rest upon whether you got your measurements right. This is a bit mathematical and you will have to dig deep and find your inner engineer. 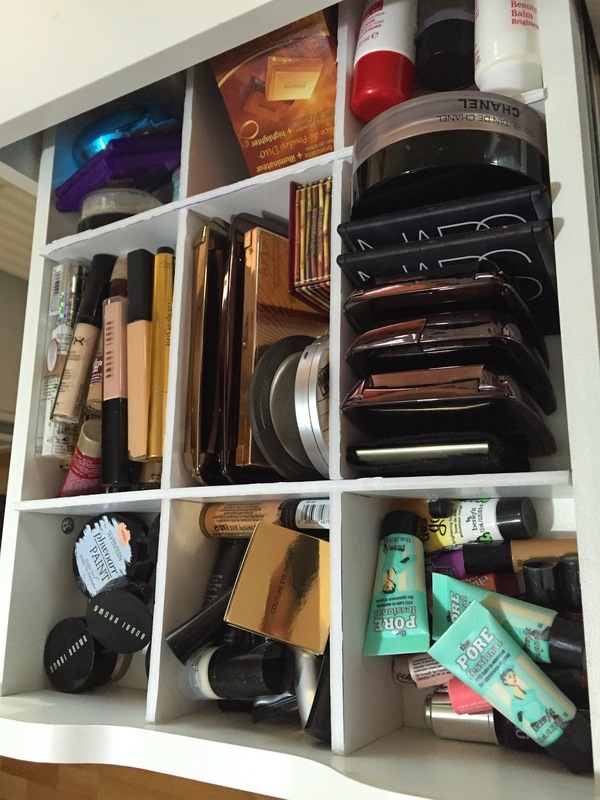 Think about how many compartments you want in your drawer, how big do they need to be, how can you make them fit. I drew out a map with the exact measurements for each drawer I was working on. First things first. and this applies irrespective of what drawer you are using as your basis, get your measurements down to the last mm. FYI a shallow Ikea Alex drawer in the tall unit is 42cm x 29.5cm and the depth is about 6cm. 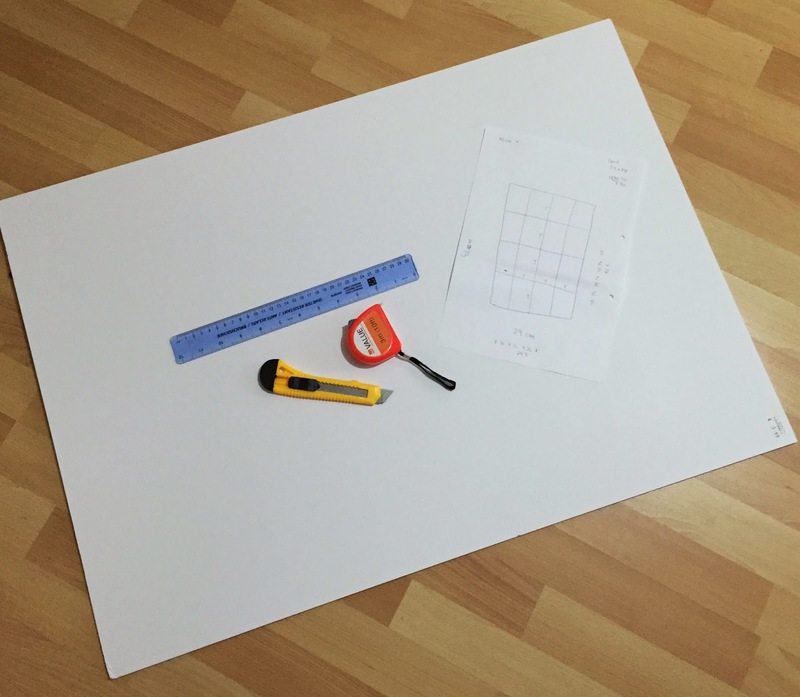 If you get an A1 piece of foamboard, the measurements should be 84cm x 60cm which is almost perfect to start working with- half it, then quarter it, and you will get four Alex drawers out of one single sheet, making it a very respectable €1.50 per drawer to create the dividers. Next up, once you have your measurements, you can start marking the foamboard accordingly. In simple terms, I took 6cm columns, marked where I wanted the dividers to meet down along, and left a 3cm x 5mm rectangle to cut out to that I could get the dividers to stick together snugly without the need for glue or adhesive. You should have three long pieces and three shorter pieces. Once you have the 6 dividers cut out into strips, take out the little rectangles that you've marked. ...and you will be left with 6 pieces of foamboard like this! Insert the structure into your drawer- again, if you got your measurements right, it should fit in very snugly against all four sides of the drawer. The foamboard is good and thick and strong so it pretty much feels like little wooden dividers. And voila! There you have it! Can you believe how simple, inexpensive, quick and effective these dividers are? They are miles better than anything you could buy in a shop and you also have the freedom to make the compartments whatever size you want. It's so simple, a kid could do it (but you might want to watch them with the knife!). As for an example of the finished product and the results proper dividers can bring, check out my blush and single eyeshadows drawers now that I have proper dividers. I'm just chuffed with the result- I don't think you can achieve better than this to be honest! So, tell me, are you inspired to go out now and DIY up some of your own drawer dividers? 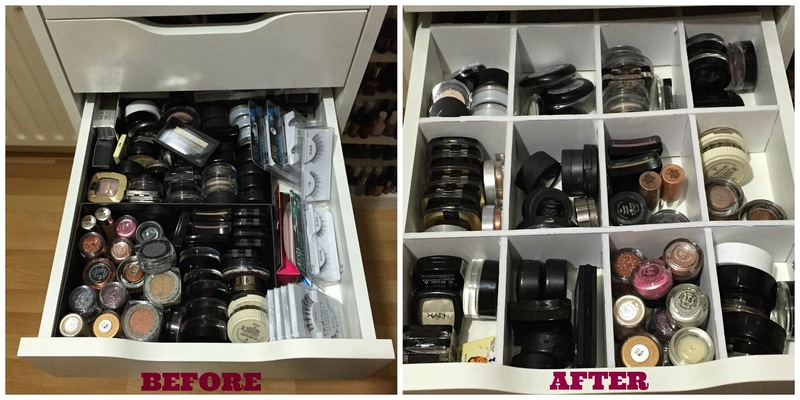 Are there any other makeup storage tips that you would like to share? that is fantastic! you are amazing at DIY stuff! i definitely am going to try this, thanks for sharing! I wondered if u could help me here. I got a fitted sliding wardrobe recently, to tidy this room up. they didnt provide drawers though :( only shelves. so i have just shelves instead of drawers. I was just wondering where or how am i gona store my make up. I have 3 bags of make up! I want them all in one bag, or one place yi know. Would be nice if it was all in a box or or somethin all divided up. I duno wot to do. This is brilliant, I was looking for affordable ways to setup my storage. Thank you for sharing!! I'm from the u.s. and wanted to know what the overall measurements of the board before the cutting began? This is brilliant, well done!! Wow!! Love this idea, GREAT JOB! I may just have to try this!